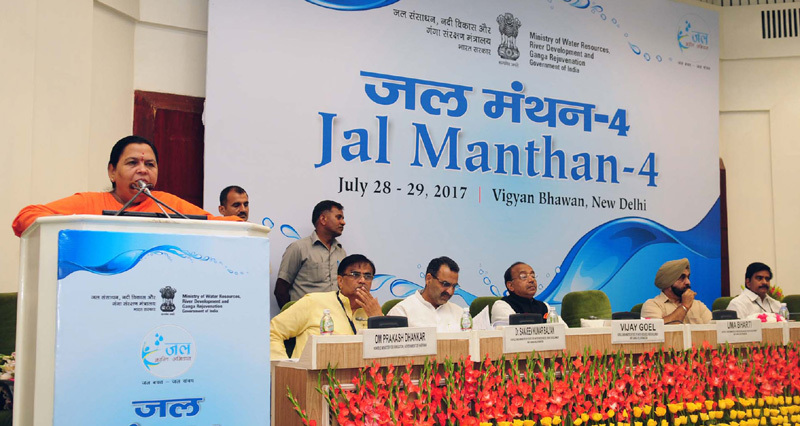 The Union Minister for Water Resources, River Development and Ganga Rejuvenation, Sushri Uma Bharti addressing at the inauguration of the Jal Manthan-IV, in New Delhi on July 28, 2017. The Minister of State for Youth Affairs and Sports (I/C), Water Resources, River Development and Ganga Rejuvenation, Shri Vijay Goel, the Minister of State for Water Resources, River Development and Ganga Rejuvenation, Dr. Sanjeev Kumar Balyan, the Secretary, Ministry of Water Resources, River Development and Ganga Rejuvenation, Dr. Amarjit Singh and other dignitaries are also seen. New Delhi: Union Minister for Water Resources, River Development and Ganga Rejuvenation Sushri Uma Bharti has said that there should not be any politics on water and State should rise above their State outlook and should work for a national outlook on water management in the country. Inaugurating the fourth Jal Manthan, a national seminar on water related issues in New Delhi today, the Minister said “Water should not be on fire but should always be used to douse it”. She said some State Governments are afraid of taking an open stand keeping in view the national interest just because they are afraid of political opposition. Sushri Bharti said, “The onus is more on opposition than the government to amicably solve the water related issues in the country. I have decided that in future whenever I meet any States Government leaders on water related issues I will also speak to the opposition there”. She said centre is always concerned about inter states disputes on water and tries to solve it amicably through persuation. She appreciated political maturity shown by the Chief Ministers of AP and Telangana to solve the water disputes between the two States and urged the other States to emulate the same. 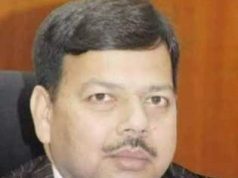 Referring to the interlinking of rivers the Minister urged the officials of UP and MP present in the seminar to amicably solve the pending issues related to Ken-Betwa link so that Central Government may go ahead with the Phase I of the project at the earliest. She said Maharashtra and Gujarat are cooperating with the centre at a much faster pace to complete Par-Tapi and Daman Ganga-Pinjal link projects. Sushri Bharti said that sometimes there is misconception about the interlinking of river in some states because of lack of information. For example in Odisha a section of people were opposing Mahanadi-Godavari link because there were thinking that entire water of Mahandi will be transferred to Godavari. 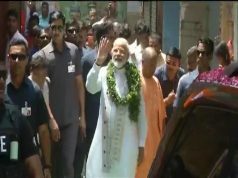 But when they were told that extra water of Tista and Sankosh will flow to Godavari through Mahanadi they were satisfied. The Minister stressed that centre will never deprive any states of its water resources. Sushri Bharti expressed the hope the deliberations in the seminar will be helpful for all stakeholders to formulate a good water resources management policy and suggest changes to improve the existing frame work. Minister of States in the Ministry Shri Vijay Goel and Dr. Sanjeev Kumar Baliyan also addressed the inaugural session. Agriculture Minister of Harayana Shri Om Prakash Dhankar and Water Resources Minister of Andhra Pradesh Shri Devineni Uma Maheswara Rao were also present in the inaugural session. Towards its commitment for wider consultations among various stakeholders and to brain-storm new ideas for solutions to various issues of water sector the Ministry of Water Resources, River Development and Ganga Rejuvenation has organized the two-day national seminar titled “Jal Manthan – IV”. Union Ministers of related Ministries/Departments, Chief Ministers of some States/Union Territories, Irrigation/Water Resources Ministers of States/Union Territories, eminent experts in water sector, representatives of NGOs and senior officers of the Central and State Governments are attending the seminar. On the first day, consultations and discussions are being held on Pradhan Mantri Krishi Seenchai Yojana (PMKSY) and its implementation and the Review of progress made by States under Accelerated Irrigation Benefit Programme (AIBP) and Command Area Development (CAD) etc. The speakers include Shri Brijmohan Agrawal, Minister for Water Resources, Government of Chhattisgarh, Shri Girish Dattatray Mahajan, Minister for Water Resources, Government of Maharashtra, Shri T. Harish Rao, Minister for Irrigation, Government of Telangana, Dr. Amarjit Singh, Secretary, MoWR,RD&GR, Shri A B Pandya, Former Chairman, CWC and Shri Narendra Kumar, Chairman, CWC. The discussions on the second day would focus on Inter-linking of Rivers and its implementation followed by Chintan Baithak to be chaired by Sushri Bharti. Shri A. D. Mohile, Former Chairman, CWC and Shri S. Masood Husain, Member (WP&P), CWC will be the main speakers on the second day. It may be recalled that the Union Minister for Water Resources, River Development and Ganga Rejuvenation Sushri Uma Bharti has been emphasizing the need to hold wider consultations amongst various stakeholders engaged in water resource development and management to achieve synergy of water resource development with environment, wild-life and various social and cultural practices. Jal Manthan programmes are being held to achieve this purpose. The three earlier Jal Manthan Programmes held in November, 2014, February, 2016 and January, 2017 were a huge success.